A number of cases have, at various times, been .brought before the public, regarding persons who were supposed to have had their health injured by the bright arsenic green color of new paper with which the walls of their rooms were covered. It was supposed that part of the arsenic in this color was volatilized by the warmth of the apartment, and by floating in the atmosphere was inhaled, and thus caused injury to the inmates. To test the accuracy of such statements, the London Engineer states that A. Abel has made a series of experiments in a room, the walls of which were covered with new green paper, containing about two-tenths of a grain of arsenic to each square inch of surface. The room was, during the first experiment, kept closed for thirty-six hours, and then the air in it was drawn through a solution of the nitrate of silver for five hours, and afterwards through a tube filled with asbestos moistened Jwith ammonia nitrate of silver. Not a trace of arsenic was thus detected in the air. He then passed air heated to 90 Fah. over strips of arsenical paper hanging for a week, at the rate of a cubic foot every two hours; and he then tested this air also with ammonia nitrate of silver, but no arsenic was found to have been volatilized. The conclusion at which Mr. Abel arrived from his experiments is, that no injurious consequences can arise from wall paper colored with arsenical pigments giving off any of the arsenic. He believes that the cases of persons reported to have been injured in health by such wall paper were not correct ; that the sickness of the parties was due to some other cause, and was wrongly attributed to the arsenic in the green paper. Mr. Abel may be correct in his conclusions so far as his own experiments are concerned ; nevertheless, it is a well-known fact that those operatives who are engaged in the preparation and printing of arsenical pigments suffer in their health from the arsenic, and nothing else. We therefore deprecate the employment of arsenic in painting, printing, or any of the common arts of life. Doty&apos;s Fruit Gatherer This fruit gatherer is intended for all those kinds of fruit which grow upon large trees, but it is more especially intended forgathering apples, which are now usually picked by hand. When fruits fall on to the ground, they become bruised and injured so much that in a few weeks decay sets in and they will not keep, so when it is desired to keep any fruit through a winter or for consumption early in the next year, the fruit is picked by hand, which is not only a long and tedious process, but one which adds considerably to the expense of the fruit. This apparatus, the invention of Wm. Doty, of South Hartford, N. Y., enables the apples to be gathered by shaking the bough, and catches them on a soft and yielding material, so that they do not become bruised, nor dothey fall to the ground. Our engraving is a view of one of these apparatuses spread under a tree, and also illustrates the method adopted for detaching the fruit by means of a pole. The fruit gatherer is a frame on four legs. A, which can be lengthened and shortened as desired by means of sliding pieces; from this frame project bars, a, that are kept " taut" by means of cords and hooks, and these pieces, a, enable a greater surface to bespread by the apparatus. The frame can be moved from place to place or from tree to tree by means of the handles, b 6, of which there are a pair on each side. From the pieces, a, is suspended a cloth, C, which has a square hole in its center, and is stitched on three sides to the inclined cloth bed, d. There are also two other cloths, B B', suspended from a, and any apples falling from the tree on to the cloths pass down over the inclined cloth, dj on to a grating, x, through which the smaller apples pass, and the large ones will go down the spout, E, into the bag spout mouth, E , from which they can be packed in barrels, boxes, or other convenient receptacle. The smaller apples drop gently on a lower grating, x, through which the sticks, leaves, and other foreign substances can pass and allow the apples to roll down the spout, G, into the spout mouth, H. Should the apple not be very regular in its form, it will not roll from the grating, but will stay upon it to be removed by hand, thus the apparatus will only deliver such apples as are marketable, and divides them into sizes fit for the same place. The gatherer is a long pole, I, having a hook. 2, at one end, which can be made to grasp the bough by means of a lever and a wire from the handle to the hook, with this the bough is shaken and the fruiU falls off. 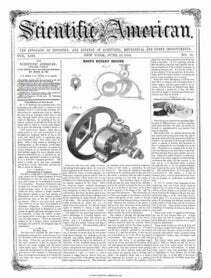 It was patented Oct. 27, 1857, and the inventor will be happy to furnish any further particulars. Some of our cotemporaries state that a seam of coal, six feet thick, has been discovered near Toronto, C. W., and great excitement has been caused thereby. Geologists have reported that there were no coal formations in that region.